The God instinct is hard to explain simply because I know not where to start. For me, it comes from this: I believe in God. But really, why? A part of it stems from my being too scared not to, perhaps because there is too much at stake. From a logical vantage point, the favour is in the belief in God. We know this for instance when we consider Pascal’s Wager: quite the famously objective and brilliantly simple argument—though not flawless. 1. If God exists, the believer has everything to gain but the unbeliever has everything to lose. 2. If God does not exist, the believer loses little and the unbeliever has gained very little in the short run. 3. 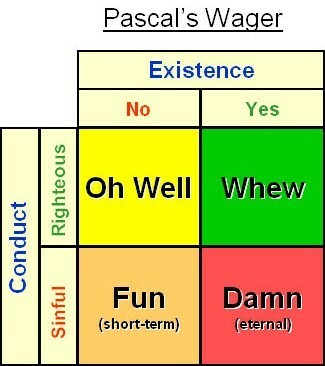 Logically, therefore, place a wager on God’s existence because one will gain more (in total) if God exists as opposed to risking eternal damnation. Quite simple isn’t it? But the flaw arises in that this argument necessitates only logic for belief. Should faith, then, be irrelevant for the belief in God? I think not. In college thy faith, if any, is challenged mercilessly. Some classes take aim to shatter; others, if you’re lucky, might help to nurture. For the “Academic” the process in vogue is that concepts are conceptualized through testable and observable phenomena. While this is not exclusive, it is, however, quite characteristic of academia to rely on observable concepts to base their hypotheses, theories, calculations and what not. However, this, I believe is where the divergence occurs and should be appreciated. The need for science and religion to co-exist and mingle has been so pedestalized of late; but really, is this necessary? Without the existence of the other, neither will diminish. However, I do accept that with the existence of the other tis true that either can flourish. But in essence, their dependence isn’t necessary, even though they may complement and insult one another whenever they choose. Pure faith entails the belief in something with or without observable evidence. Gravity is only a theory. Will we float away tomorrow? Faith sparks hope when all lights go out; what pushes us forward when the observable is drenched in darkness? But the moment evidence flicks its head the subject is susceptible to the infiltration of science. See, I think what I’m getting at is that if faith and evidence are meant to travel asymptotically (parallel), I think there is nothing wrong with that. Religion does not need science to prove itself, and vice-versa. Fundamentally, these two subjects are based on very different cores. If the two complement one another, jolly good! If not, why bother? But we can’t stop bothering can we. Because inherent in the human is the urge to know. Whether a Neanderthal or a Homo Sapiens Sapiens, Truth has always been lusted for through the millennia. We crave it no matter what, and if we don’t get it, we mould our own truths and try to satisfy ourselves with them. But then what of God and his existence? I think Micheal Foulcault distributes a well polished lens to look through, particularly in his social theory Panopticism when he writes “visibility is a trap.” Visibility dislodges the well oiled cogs that function to create power. The strongest power is that which is invisible; undetectable; untraceable; simply put, unconquerable. It is when you cannot pinpoint the exact power to which you yield that you so willingly submit. Governments know this divine trick inside and out. Why do you think we have bureaucracies? If the one pulling the strings is invisible, how then, do we cut our cords? But in terms of government the illusion exists that we think we know where to point. We have leaders from who we demand accountability. We have government buildings and parliaments whose architectures stand erect and visible to the naked eye. But a president shot, and a parliament burnt: does the power diffuse? No, because this breed of power I’m talking about is so great it evolves into an automatic function where we ourselves turn unknowingly as the cogs for this well oiled machine. See something suspicious: call the Police and sound the alarm. He isn’t wearing the expected attire: laugh and call him out so that he is made an example of what not to be so it shan’t happen again. That we keep each other in check is the evidence of seamlessly invisible power. So if the highest power functions invisibly, is this argument, then, a form of evidence for faith in God? It is what you make it to be. But I would ask you, if God showed Himself openly, what, then, would be the test? Adieu. Absolutely brilliant. I love the passage where you talk about faith. That's exactly what I've been trying to say! Again brilliant piece of work!